I'm trying to justify today's recipe because tomorrow I intend to give Lorraine Pascale's minted lamb burgers a try. I needed something to put them in and having read less than complimentary reviews about Ms Pascale's own buns (I will try them out one day because I'm fully aware that different bakers get different results with the same recipe), I felt that if I was going to have guaranteed success, the recipe would have to come from Short and Sweet. Now don't get me wrong. Much as I rave on about Dan's recipes, there are a couple that haven't turned out as fabulously as I would've hoped. I'm still not convinced by the fish and chip smell of the flash bread (although Miss A thinks it's the best bread ever) and I found his soft baps (trialled in my pre-blog days) a little sweet for my taste. But in fairness, both of those are just down to personal taste. The results of the actual recipe were spot on. In fact, I'm trying really hard but failing to imply that Short and Sweet is anything short of perfect on the baking front. I'm just a little bit obsessed. And I am so grateful to Twitter for a) bringing this book into my life and b) introducing me to a whole bunch of Short and Sweet addicts so I know I'm not alone in my obsession. If you're on Twitter, you should follow all of these like-minded Dan Worshippers immediately. In alphabetical order @21_UrbHousewife, @BakingElements, @EversNanaJules, @HungrySquirrels, @Tarb2010 and @UnderTheBlueGum and read their blogs too. And of course, the man himself - Mr @Dan_Lepard. 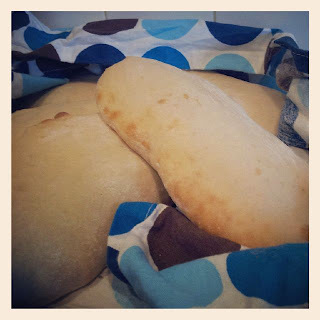 Anyhoo, over the weekend the lovely Victoria (aka @21_UrbHousewife) tweeted and blogged about Dan's Perfect Plain Pita* and I knew I just had to have a go. Seventy five minutes from start to finish and you have perfect, plain pita. In fact we had a brief discussion on the subject of Dan's Corn Oil Tortillas along with Sadia (@BakingElements) and Jules (@EversNanaJules - also an enthusiastic fan of Dan's pitas) and it was agreed that it is nearly as quick to bake the tortillas from scratch as it is to open a packet from the shop. Mostly because I can never get the packets open without a) swearing; b) cutting myself and c) ripping the original packaging so that the resealable bit becomes completely redundant. But if you think that home made tortillas are in another class then you'll think you've died and gone to pita heaven trying this recipe. I vow from this day forward to never ever ever buy shop-bought pita again. Seriously. To me, shop bought pita are something you buy when you're trying to be a bit healthier than normal. You buy them, slice them, fill them with salad and then they fall apart before you've even managed to pick them up and guide them mouth-wards. Maybe that's why I see them as diet food. Because I always end up dropping most of the filling and getting trampled on as my dogs fight for the spoils. They're also really dry and a bit like old shoe leather. The only way they're remotely useful is cut into strips, toasted and dipped into hummus. But how about warm, pillow-soft, snow white pita, fresh from the oven. Yes, you could probably make a lovely pillow from this dough, it's so soft and bouncy. It starts out like pretty much any other bread dough - flour, water, oil, sugar and just a small bit of yeast because as Dan says, the rise is generated by the heat from the oven. 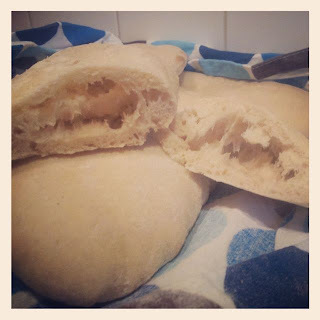 Just before baking, the dough seemed to have a life of its own; blowing out tiny bubbles which I worried about bursting whilst shaping and rolling in case my pita didn't rise. I needn't have worried. They cook in just 3-5 minutes at maximum heat on my oven. Dan suggests a minimum of 250c/230c fan/hotter than gas mark 9. The numbers have rubbed off on the dial of my cooker past 200 so I just whacked it up to maximum (it's a fan oven) and prayed. I often wish I had the patience to sit and watch things bake through the oven door so I can be proud that my baking is doing it's thing - I'm sad like that. And for once, with these pita, I was able to. They puff up before your very eyes and it is quite amazing. The first two or three batches-worth. I really do need to get out more! The inside view. Faintly reminiscent of a scary fish. And when you bite into them, it's a really weird experience. I was fully expecting it to be a tiny thin crust with a huge pocket of air in the middle, but in fact there's a good centimetre of dough in there - hence the pillowy softness. I cut one open so you can see what the middle looks like. The picture doesn't really do the pita justice - in fact, I think it's reminiscent of one of those weird ugly fish you sometimes see scaring small children in a fishmongers window. But from a bakers perspective, you can see the beautiful framework that the dough and air have created. This is how a proper sandwich pita should be formed and I'm reliably informed by Victoria that they are perfect for ramming full of falafel. And stuffing yourself with. Even the husband enjoyed the one he had straight from the oven. You can find the recipe online here or in Short and Sweet. Great post! and thanks for the mention(s) *blush* these really are the best pit(t)a I've ever had at home! can't wait to hear how they turn out with the lamb burgers!